Thank you for all the kind comments and well-wishes and prayers on the last post. Even though this blog is as much me working out personal stuff as it is discussing baseball cards, I often hesitate before placing full-fledged personal issues here. I decided to go ahead this time just because you never know who can be helped. I'm glad I did. I probably won't need to take any of you up on your offers of assistance (well, except for you, Angus, I'm going to that card show next month no matter what! ), but it means a lot that people care. Meanwhile, I've got cards to tend to among everything else going on, so I'm going to do that now. It's a couple of days before the start of spring and I love spring training. I love a lazy day of watching a lazy broadcast of teams lazily playing a spring training game on my TV. The only problem is, I almost never watch spring training games on TV. I'd love to -- so much. But they always occur during the busiest time of the year for me. Usually, the month is two-thirds over and I realize, hey, I can watch a spring training game on TV! Then, something very March happens and I forget all about it. So, here we are, March 18th, and I've watched an inning of a spring training game. I was at a restaurant a week-and-half ago. It was a sports bar with the required TVs tuned to different sports events. I was staring at a rugby match. My wife was staring at a spring training game between the Dodgers and White Sox. We switched seats immediately. (No, my wife doesn't like rugby). The game was in the ninth inning, so I didn't see much and that's the last of spring training I saw. 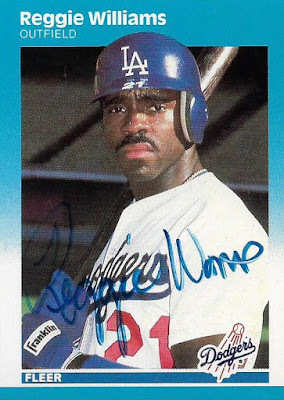 The Dodgers are on again tonight, and if nothing March happens maybe I'll catch part of that game. 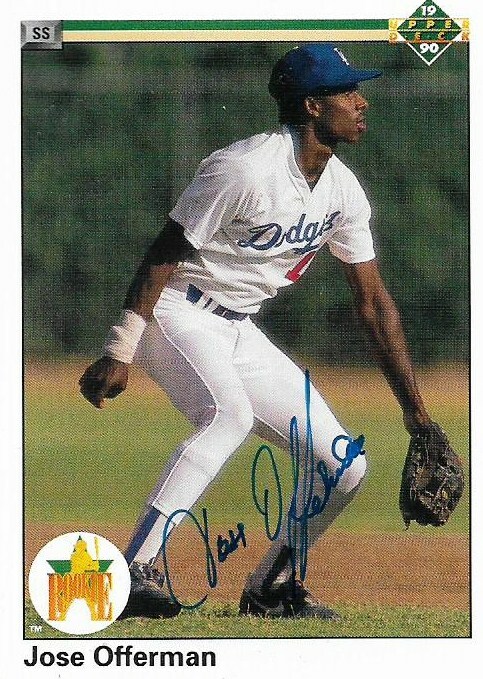 To get myself into the spirit of spring, I have some autographed cards of Dodgers of the past from Alex. 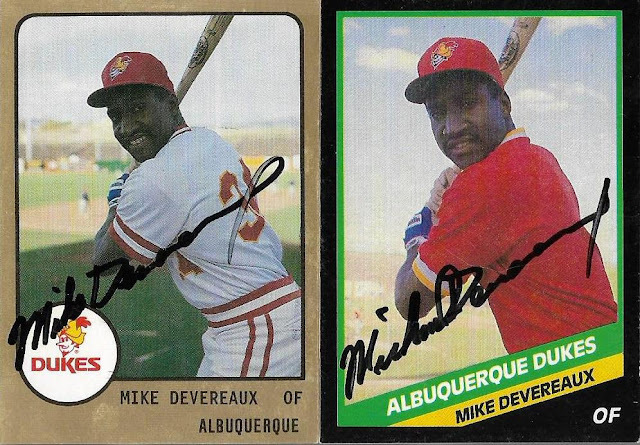 He contacted me last month and mentioned that he used to live in Albuquerque and go to the old Dukes games and get autographs. He had a bunch of Dodgers from that time period and graciously offered them to me! 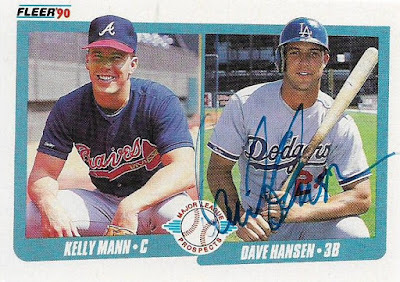 I'm assuming that Alex obtained these signatures during the course of the season -- not necessarily during spring training (especially since the Dodgers played spring training games in Florida back then). But nothing says spring training to me more than players signing autographs. I've never been to a spring training game. And I've never been one to go up to a player and ask for an autograph. However, I think that if it was around 1990 and I was at a spring game, I might be tempted. 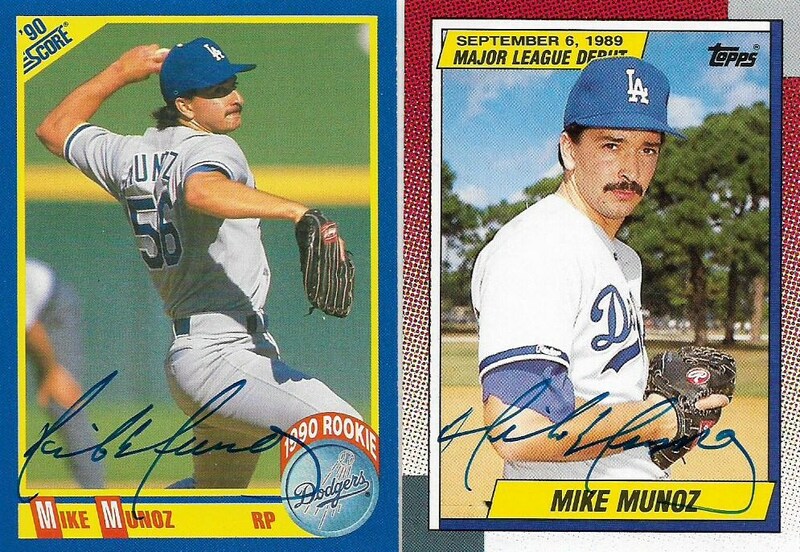 The late 1980s and the dawn of a new decade were a pretty special time for the Dodgers. They had just won a World Series in 1988 and the years that followed immediately after were full of hope ... a dynasty in the making! Of course, that never happened. The prospects on the Dodgers in the late 1980s -- many featured on the cards Alex sent me -- didn't amount to a lot. The Dodgers had to wait until the early '90s, the Piazza and Karros years, for prospects to mean something again. 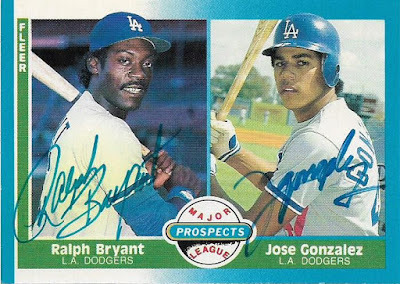 But I think it's pretty cool I have my first autographed cards of '80s prospects Ralph Bryant and Jose Gonzalez, both on individual cards and a shared card! Here is a card with scribbles on the proper side. 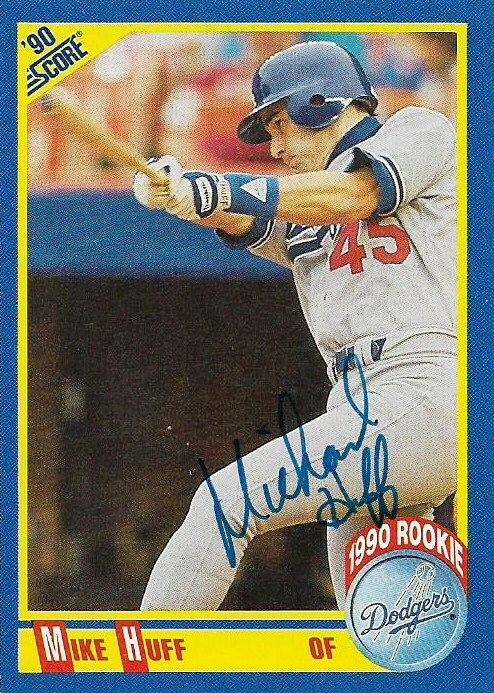 And here is a card in which you can tell that Mike Huff made sure you could see that signature. Out of the cards that Alex sent, I had only two players' signatures already. One is Jose Offerman. This is my third Jose Offerman signed card. The other is Reggie Williams. 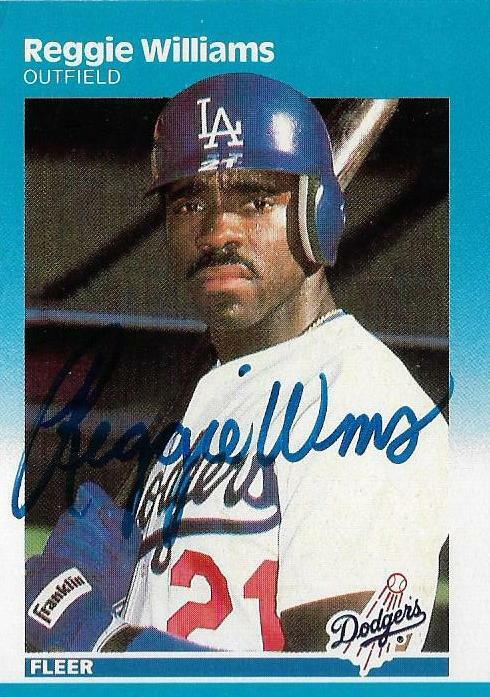 In fact, I already own this very 1987 Fleer card signed by Williams. That's the other one. Signature looks pretty authentic to me! Since Alex helped me add Mike Huff, Ralph Bryant, Jose Gonzalez, Mike Munoz, Mike Devereaux, Dave Hansen and Jeff Hamilton to the Dodger autograph collection, I thought this would be a good time to update my list of all the Dodgers for which I have autographs, on cards. 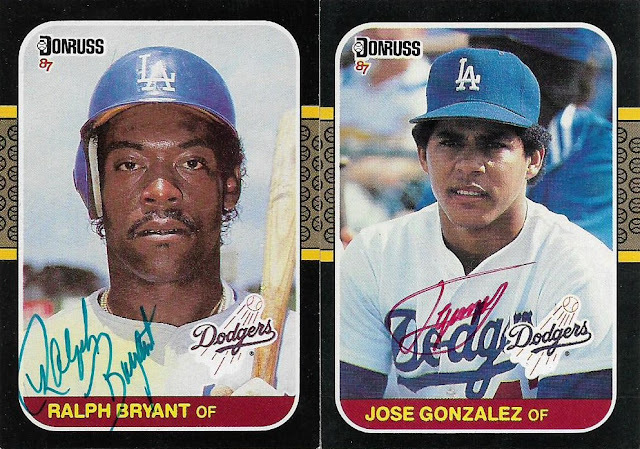 That's a healthy list, but committed Dodger autograph collectors will notice some gaps. 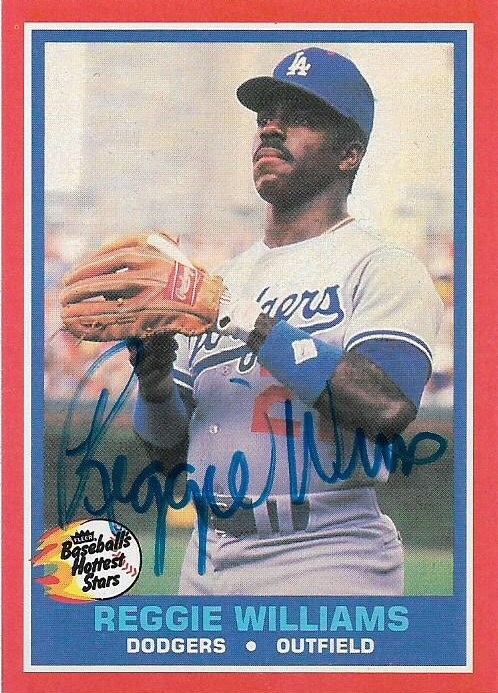 There's no Davey Lopes autograph or Reggie Smith or Mike Piazza or several other notable names. Sometimes I think about adding some of those guys, and then I forget about it because that's not really why I'm collecting. 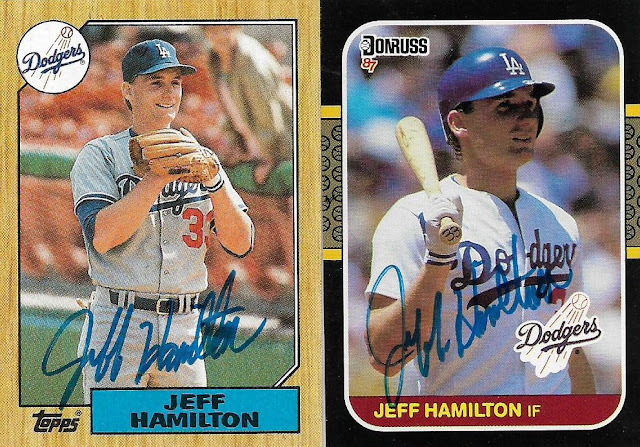 If I actually do watch some of that spring training game tonight, you can bet that a Lopes autograph card will find its way into my online cart by the end of the night. My buddy at work just came back from vacation telling me about going to a spring training game in Phoenix (Texas Rangers) and how great it was. He met one of the coaches and even got to go to lunch with him. He is nowhere near the baseball fan that I am. He doesn't even collect cards! I am so envious. Very cool of Alex. And that is one healthy list! I live in Spring Training town and I haven't been to a single game yet this year. (it is also my busy time at work) Though I do plan to go to the two games that the Red Sox come out here for, work be damned.